Hetionet v1.0 is now available online as a Neo4j database at https://neo4j.het.io. While Project Rephetio is focusing primarily on drug repurposing, we'd like to illustrate the versatility of Hetionet for answering a broad range of biomedical questions. We want to exhibit that hetnets aren't vaporware. We want to exhibit that a dozen lines of Cypher code in Hetionet can immediately perform analyses that previously would have taken months to implement. If you're a biologist and have interesting questions that Hetionet may know about, ask away. If you think you have an interesting query, please share. Next, we'll look bolster the query by adding protein interaction relationships. The following query performs a more advanced GO Process enrichment analysis for multiple sclerosis (MS) genes. First, we restrict to GWAS-associated genes, which have the advantage of being less biased by existing knowledge. 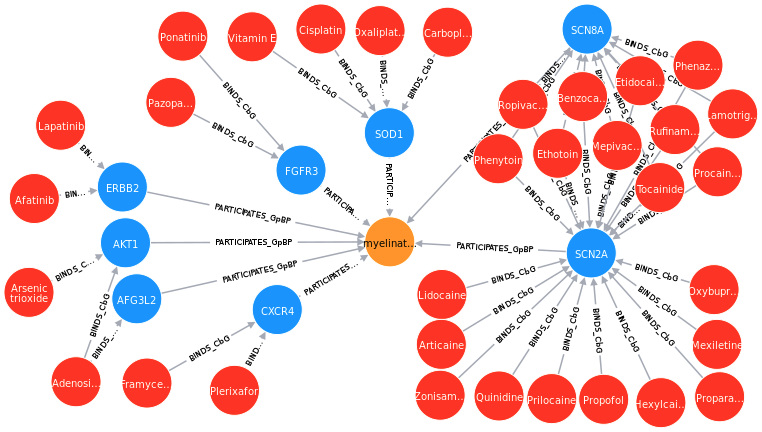 Second, we add a protein interaction relationship to identify genes in the MS neighborhood of the interactome. However thirdly, we require that these genes are upregulated in an MS-affected tissue (anatomy). Therefore, we can hopefully capture some of the benefits of tissue-specific gene networks  on our anatomy-agnostic interactome. The query took under 5 seconds and required 1,420,721 database hits. The following query looks for anatomies (tissues) which express the genes associated with migraine. The query does a good job identifying migraine-relevant tissues. However, notice that the expression profiles for the retrieved tissues are not very comprehensive: only four genes are known to be expressed in the dura mater, two of which are migraine associated. Therefore, these results are dependent on our gene expression catalog , which varies considerably in comprehension by tissue. The query identifies 8 myelination-involved genes that are targeted by 33 compounds. To retrieve these counts yourself, change the last line of the query to RETURN count(DISTINCT n1) AS targets, count(DISTINCT n2) AS compounds. If you're interested in myelination, see dhimmel/myelinet for additional queries. We can extract the paths behind contributing to the DWPC of the top hit (NR3C1). The involvement of NR3C1 in Cushingoid makes biological sense. NR3C1 encodes the glucocorticoid receptor, and chronic elevation of glucocorticoid levels can result in Cushing’s disease . Next, we'll compare our findings to the gene targets predicted to cause Cushingoid in a 2012 study . Supplementary Table 5 contains predicted target–ADR (adverse drug reaction) relationships. If we filter for Cushingoid, the predictions contain the following 8 targets: AR, KDR, NR3C1, NR3C2, PDGFRA, PDGFRB, SERPINA6, TEK. Of these 8 targets, NR3C1 was the top prediction with a Chi-square statistic of 1922.5. The targets NR3C2 and SERPINA6 were also present in our 52 Hetionet-derived genes. Hetionet v1.0 contains 5,734 side effects. The workflow and queries above can be used by researchers to highlight the potential target genes responsible for a side effect of interest.